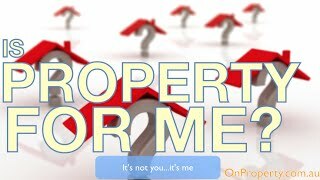 Is Property The Best Investment For You? Is Property The Best Investment For You? Property can be a great investment to grow large sums of wealth. But is property the best investment for you? I don’t know anything about you so for me to say “yes property is the best investment for you” would be completely naive. It’s important you decide this for yourself. I’m just going to help you decide whether or not property is the best investment for you because property investing can be great but it’s not for everyone. With so many investing options it’s important to chose the one that’s best suited for you. Property is simply a means to an end. The reason we invest in property is so we can achieve an end goal whether it’s financial freedom, to quit our jobs, to go on an extra holiday each year, or to spend more time with our families. In the end it’s about achieving a goal and property investment isn’t the only way to do that. So rather than setting a goal to get rich from property start by setting a goal and consider the best options for how to achieve it. This could be through property alone or it could be a mix of things. You won’t know until you consider all of your options. Here are some questions to ask yourself if property is a good investment for you. #1: Do you want to be an active investor? From everything I’ve read and everyone I’ve talked to the people who get rich and achieve financial freedom quickly are active investors. Being an active investor means being actively engaged in the property. This could be doing renovations, doing sub divisions or actively researching areas to purchase more property in. There are people that invest in property passively and still achieve a level of success. However if you want to achieve success quickly then you need to be an active investor. You can be active by spending more time learning about the property market or spending time on your properties in particular. If you don’t want to be an active investor then property probably isn’t going help you get where you want to go as quickly. #2: Do you have leftover disposable income? Depending on how you want to invest in property, you need to look at your income and your lifestyle. Consider whether or not you would be able to cut back somewhere so that you could pay for a negatively geared property. It’s important to understand what your financial situation is because even if you can’t pay for a negatively geared property then you still have to consider paying for a positive cash flow property if it sits vacant (in which case it becomes negatively geared). The fact is that no property is without risk and you need to consider if you have enough income to buffer any risks associated with a property investment. #3: Do you have a full/part-time job or solid business? If you don’t have a job then you need to have a solid business that’s been around for at least 2 financial years. You are going to find it very hard to get the funding to invest in property though. I just went into business myself in October 2013. I quit my job, relocated my whole family to Queensland and now work online. Starting and running your own business can be good but it also means you need to establish some financial years so the banks will see you as a solid business they can lend money to. There are some ways around this. For example you can purchase properties and get owner financing which is where you are financed by the owner of the property and not the bank. However it’s going to be much more difficult to do it that way. Having a job or established business will make it much easier to invest. #4: Are you good at saving? In order to purchase your property you need to save a size-able deposit before you can invest. Ask yourself if you are a good saver or if you can learn to be one because it would be hard to get a 100% loan to purchase a property. You’re going to need to save some form of deposit. #5: Does property actually appeal to you? This doesn’t mean getting rich through property but does property itself genuinely appeal to you. When I was 14 I was reading property magazines. Then when I was 16 I read Steve McKnight’s book 0 to 100 properties in 3.5 years and for the next couple of years I spent my time saving money, reading about properties, looking at properties and making offers on properties that I couldn’t afford. Property wasn’t my life but it was something I was very passionate about. Stocks on the other hand I absolutely hate. It took me many years to even understand what a stock was. I finally understand what the stock market is and how it works but I just don’t care. I’m not very interested in it. So for me to pursue stocks wouldn’t make sense because I’m just not interested in it. If you want to be successful you need to learn a lot about what you’re doing whether it’s stocks, property or something else. So if you are not interested in it beyond the fact that it will help you achieve financial freedom then you will potentially struggle with it. #6: Are you willing to put in lots of hours? Investing in property does require time. One of the things that probably takes the most time is the research phase because you are taking the time to look at areas and properties, talking to real estate agents, getting data reports etc. There’s a lot of research that goes into it alone. You have to be willing to put in the time for research because it takes more than just a couple of hours to understand the Australian property market and you want to invest wisely. If you don’t have the time or you are not willing to spend the time then that doesn’t rule you out. You could hire a buyer’s agent who can research the market for you and find a property that suits your needs. Of course you’ll need to pay for that service and buyer’s agents usually charge around 1.5%-2.5 % of the purchased property. So for a $500,000 property an agent might cost you $7,500 – $12,000. They’re not cheap but if you have money and not time then it would be a great option. #7: What are you financial goals? My first piece of advice is to set some goals if you don’t have any. My financial goals are very clear. I want to earn $60,000 a year in passive income. Now $60,000 a year isn’t a great income and it doesn’t really allow for many luxuries for my family and me. But $60,000 is something we can live off of without worrying about working again. Once you make your goals then like I said figure out what you need to do to achieve them. If you want to achieve your goals quickly you could build a big business and then sell it after a couple of years. Take Snapchat for example. They were offered $4 billion to sell to Facebook and they are less than 2 years old. I hope that gave you an idea of whether property is for you and whether you want to move forward with it. There are many options you could choose to achieve your financial goals. You could build a business, invest in the stock market, invest in property, etc. So property can be a great way to invest for some people but it’s not for everyone.